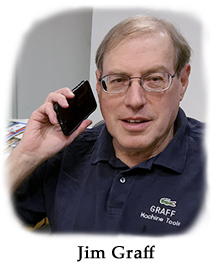 Jim Graff, owner of Graff Machine Tools, has over 40 years experience in the used machinery business. He has visited many shops and met dealers around the world during his travels, making contacts that help him buy and sell equipment. Since 2012, Graff Machine Tools has been helping manufacturers quickly locate the machines they require at reasonable prices. We specialize in screw machines, rotary transfer machines, and cnc/swiss lathes. Got a machine to sell? Jim will be in your shop within 24 hours with cash in hand. Jim has been affiliated with the Machinery Dealers National Association(MDNA) his entire working life. Graff Machine Tools is a supplier to the Precision Machined Products Association(PMPA) as well as Orthoworld.